Once, long ago, Jim Henson did his best to save the world. I have a pal and confidante who would tell you differently, but the best Fraggle in the Rock is Wembley. I find Wembley very easy to love. I have always been forced to admire those who "feel the fear and do it anyway". 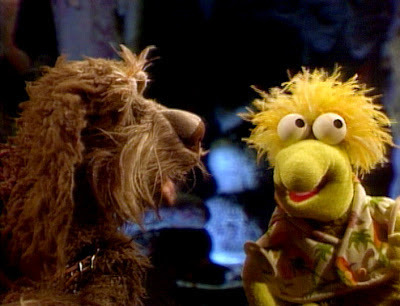 Which is not to say I didn't love the other, lesser Fraggles. After all, much of Wembley's indecisive "Wembleyness" comes from the fact that he easily imagines what it's like to be in the other Fraggle's shoes. Or, well, shirts. Shoes don't seem to have caught on in Fraggle Rock. Rage-fueled athletes might align with pom-pom headed Red, or pacifist artists with soulful Mokey. Perhaps the perpetually glum among you might appreciate Boober. A rugged outdoorsman and qualified troubadour might find himself appreciating brave Gobo. 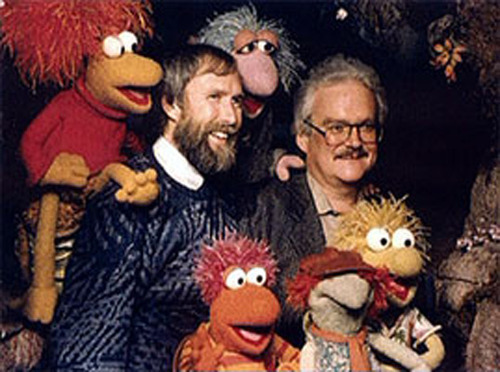 No matter where your loyalties lie, you owe much to producer Jim Henson and head writer Jerry Juhl (pictured here). The banana-shirted Wembley was performed by Steve Whitmire and designed by Michael Frith with a character based on a Charles Grodin line from The Great Muppet Caper: "Of course I meant yes. Why would I say no when I meant yes?" Perhaps his personality is a gift- a special talent he alone possesses. Or perhaps it's a curse- a special weirdness he alone is stuck with. Wembley has boundless enthusiasm for whatever everyone else is talking about in the moment. He listens to rocks, loves to eat radishes and Doozer Sticks, and he plays the bongos to relax from his job as the fire department siren.